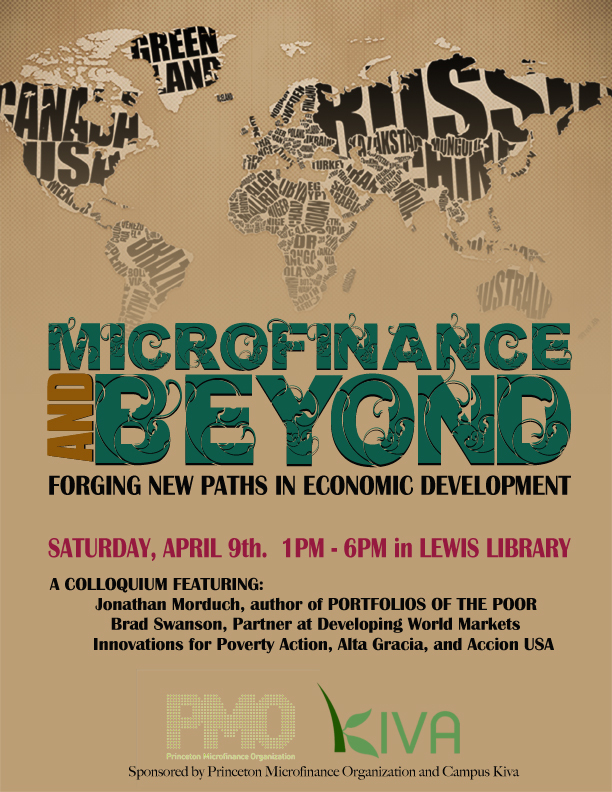 This microfinance summit is free, and no registration is necessary. The event will take place in Peter B. Lewis Library on Princeton University’s campus, which is accessible via NJ Transit. And why not? Singapore’s epic climb from a third to first world country in the latter half of the 2oth century was, in part, spurred by the efforts of Singapore’s Economic Development Board (www.edb.gov.sg) to identify and build strategic industry sectors. An important piece of this was setting aside industrial parks and providing incentives for foreign investors to set up shop. Eventually, as they shifted their focus onto more knowledge-intensive activities (such as R&D, engineering design and computer software services), the government built research parks. What about the role of local enterprise? In 1986 the EDB established the Small Enterprise Bureau. Ten years prior to this the Small Industry Finance Scheme provided small loans (here we’re talking around $250,000) to local small to medium-scale enterprises. The EDB was able to create an innovative and business-friendly environment that attracted foreign direct investment. They transitioned from a focus on manufacturing to a knowledge economy, where a highly educated population became their biggest asset – a market incentive for high quality education. Today, Singapore’s economy is thriving and it’s ranked #1 in the world in ease of doing business in the World Bank’s 2010 Doing Business Report. We can learn a lot from the steps that Singapore took to achieve real and lasting economic growth. Of course, the picture is not all rosy. This was done under a largely autocratic government and one wonders if such progressive action could have been carried out within a democracy. The question now is: results. Will Kenya and Nigeria be able to catapult themselves into the IT sector? Will these spaces attract the types of dynamic communities that create real growth? Only time will tell, but they are certainly off to a promising start! Come join us for a presentation of Dvelo.org (http://beta.dvelo.org/index.php), a recently-launched platform to connect investors with communities in the developing work. Dvelo.org motivates lenders with financial and social incentives to lend small quantities of investment to capital constrained microfinance institutions. Microfinance institutions can then use funds raised on Dvelo.org for portfolio expansion, capacity building, and other productive purposes before repaying the lenders with interest following the maturation of the loan. Since its public launch in December of 2009, Dvelo has raised resources from among its 200+ users for communities on three continents. The presentation will unpack the developers’ previous experiences in microfinance in Peru and South Africa and how it led to Dvelo.org’s formation and business model. The presentation will be followed by an informal dinner discussion in the Rocky Private Dining Room. No sign-up required, come when you want, leave when you must! Come check out the kick-off event of the Princeton Microfinance Organization’s (PMO) Fall 2009 speaker series! Steve Beck, a leader and innovator in economic development and addressing the challenges of global poverty, will speak on the limits of microfinance and the importance of mid-cap finance. He is the Co-Founder and CEO of SpringHill Equity Management LCC, a private equity find manager providing growth capital and support to small and medium sized enterprises in Africa. Check out this insightful article by Kenyan economist James Shikwati. He questions the real goals and effects of development and the role of the G8. Dambisa Moyo, Zambian economist and author of Dead Aid, argues that foreign aid has not helped Africa and may have even made things worse (Munk Debates: Dambisa Moyo argues in favour of …). Although far from perfect, the microfinance sector has certainly begun to shift the focus of development strategies away from handouts and onto more innovative solutions. However it may also be prone to the same ailment as traditional aid. Ideally microfinance should help to bring about a situation in which it is no longer needed or useful: real development. So is microfinance actually furthering development? Some new studies on the effects of microcredit from MIT and IPA (Innovations for Poverty Action) are not terribly conclusive on that front. Check out a review from the Economist on this here. What is clear is that there is no magic solution. Microfinance certainly has its benefits and its place, however it is crucial to keep in mind the real goal of any poverty alleviation program: to eliminate the very need for its existence. A nice photo of the PMO from after our Spring Colloquium on Global Health and Microfinance. Check out this article in the New York Times today. It offers an interesting perspective, seeing as one of the major challenges to microfinance is investing in businesses and entrepreneurs that are likely to succeed.